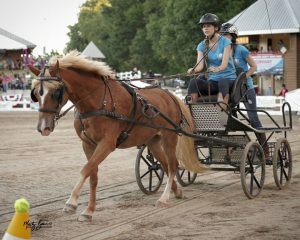 The Nashoba Carriage Association hosts events throughout the year. These include clinics with both local and nationally recognized trainers, pleasure drives, educational outings, and shows. The Nashoba Carriage Classic and Driving Derby is an American Driving Society-rated show and the highlight of our driving season. Divisions include Single Pony, Single Horse, Multiples, VSE and Draft, and we also have a Sidesaddle Division. We also host driving derbies in the spring and hold an annual Easter drive. In past years we have held events such as a Carriage Maintenance clinic in which participants learned how to take care of their vehicles before problems occur. We also held a Marathon Clinic that was attended by over 30 people. Our annual Nashoba Carriage Classic and Driving Derby will take place on October 19-21, 2018, at the Germantown Charity Horse Show grounds. Please visit our “Clinics” and “Shows” pages for more information on upcoming events!